These Soft Gingerbread Cookies will be a holiday staple! They’re incredibly chewy with tons of flavor from the molasses and warm spices. These gluten-free, paleo, and vegan cookies are sure to be a hit. Who loves gingerbread cookies?!? If I’m honest with you all, gingerbread isn’t usually my favorite of the holiday flavors. 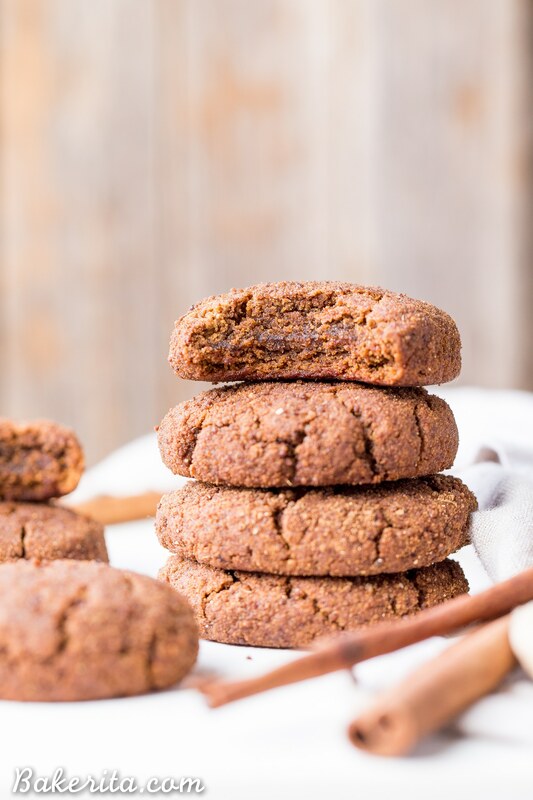 The typical super crunchy and thin gingerbread cookies just don’t really do it for me – I typically prefer some chew, and/or chocolate to be involved. How about you? We also just didn’t make gingerbread cookies too often when I was a kid. We were much more enthralled with making batch after batch of Magic Cookie Bars during the holiday season. This year though, I got a few requests for soft and chewy gingerbread cookies. First, from my boyfriend, and then from a bunch of you readers! Obviously, I had to make it happen. And they had to be DELISH; deliciousness enough that even I would want to devour the whole plate. 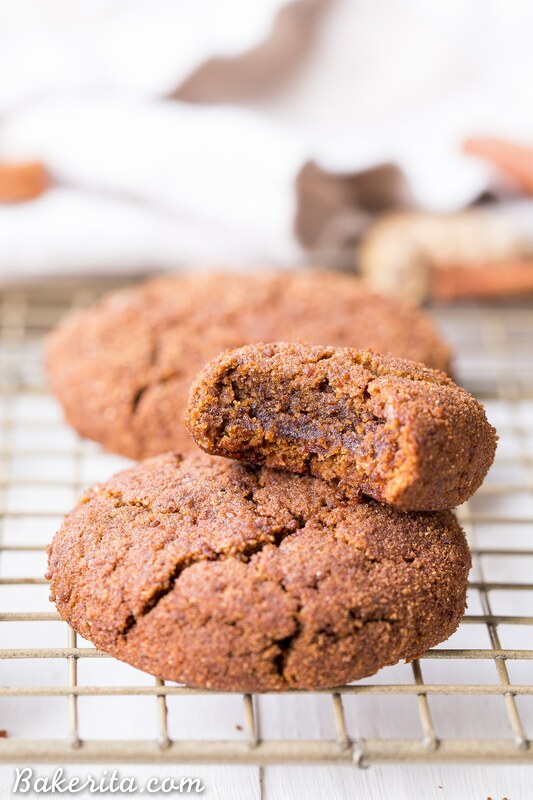 I wanted chewy, soft, thick, and super flavorful cookies, full of deep + rich molasses flavor and just the right balance of warming spices. I also wanted them to be paleo and vegan, so they could be enjoyed by all. Surprisingly, I knocked these out of the park on my first try (not to toot my own horn or anything). 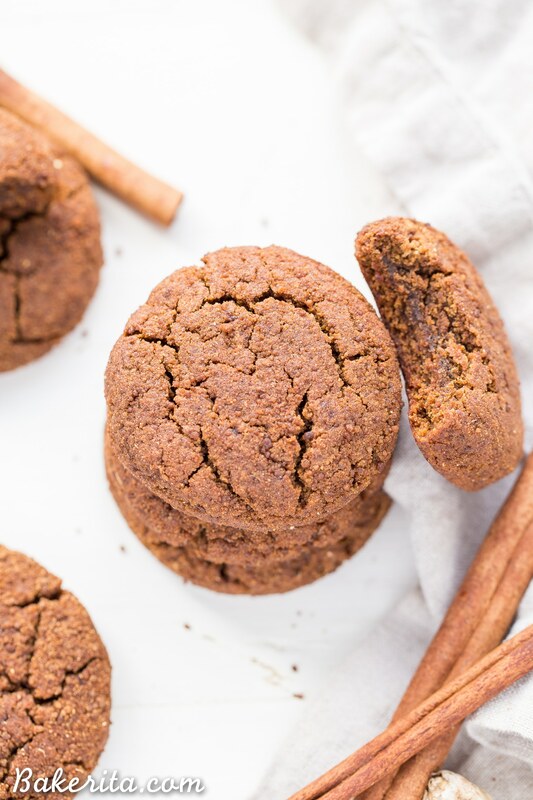 I heavily adapted them from my super popular Coconut Flour Chocolate Chip Cookies, adding the molasses and spices to make them perfect for the holidays, along with a roll in some coconut sugar and spices before they’re baked. They come together super quickly and easily, even more easily than most gluten-filled cookies. There’s no need to get your stand mixer out – these are super easy to stir together with a bowl and a wooden spoon, and the dough comes together in about 5 minutes. To keep them vegan, I used flax eggs. If you’re not interested in keeping these vegan, you can use an egg + an egg yolk to get the same texture. For the flour, these use coconut flour! You only need 1/2 cup for the whole recipe. I wouldn’t recommend replacing the flour with anything else here, since coconut flour is so uniquely absorbent. Once the dough is ready, I recommend scooping these up with a cookie scoop, rolling the dough balls in the coconut sugar/cinnamon/ginger mixture, and then flattening them out a bit. These cookies don’t spread too much, they just puff up and out slightly, so it’s best to flatten them to your desired shape with your hand before baking. You can bake them on the shorter side, for about 10-11 minutes for a softer cookie, or leave them in for an extra few minutes if you want crispier edges. Either way, these are sure to be a hit. 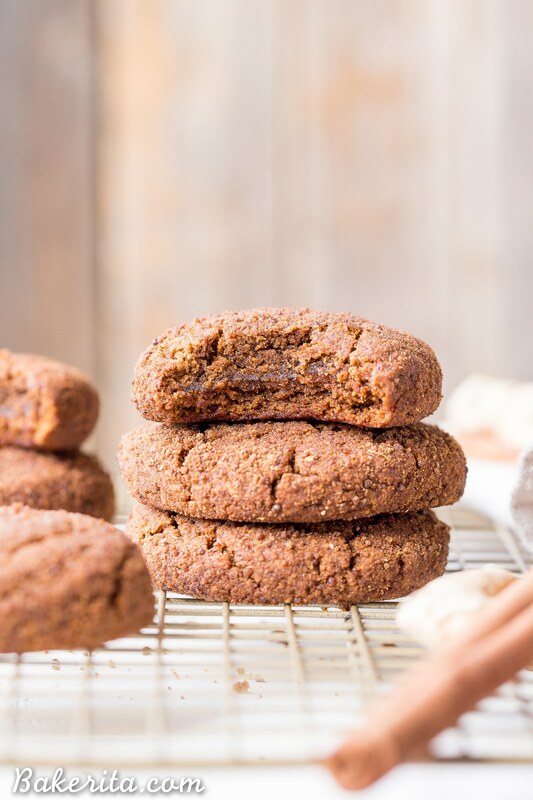 They’re dense, chewy, soft, and pure gingerbread flavor perfection. These are the perfect treat for your holiday cookie platter, but I won’t tell if you want to keep them all to yourself ;) enjoy! In a bowl or stand mixer, beat together the coconut oil, almond butter, molasses, and coconut sugar until smooth. Add the flax eggs and vanilla and mix until smooth. Add the ginger, cinnamon, baking soda, salt, nutmeg, and coconut flour to the wet ingredients. Mix until well incorporated. In a separate small bowl, combine the coconut sugar, cinnamon, and ground ginger to roll the dough in. Use a small or medium sized cookie scoop to form cookies and roll in the cinnamon sugar mixture. Place 2” apart on the prepared baking sheet. Press down slightly to flatten - note that the cookies won’t spread very much, so press them down to the thickness you prefer. Bake for 11 minutes or until the cookies have puffed and are cooked through. You can bake for an extra minute or two for crispier edges. Let cool for 5 minutes on the cookie sheet and then move to a cooling rack to cool completely. Enjoy! If you don't want/need to use flax eggs, replace the two flax eggs with 1 egg + 1 egg yolk. Hehe they were definitely hard to stop devouring. You’d love these Elizabeth! I wouldn’t recommend it – molasses has a very unique flavor that essentially is what makes these gingerbread cookies. These look amazing!! Could I replace the coconut flour for another flour? Thanks Valerie. As mentioned in the post, coconut flour is uniquely absorbent and no other flour will perform the same way here. I hope you’re doing well. I discovered your blog a month ago and already made 6 recipes that turned out AMAZING. I am so grateful for all those wonderful and tasty recipes. I struggled a bit to find all the ingredients since I don’t live in the US but I still managed to find most of them. I still didn’t find the molasses though … Do you know how I could replace it ? Or maybe how I could make it ? Thanks again for sharing these delicacies with the world ! Yess so thrilled everyone was a fan! Thanks so much for your feedback Pierre. Dipping them in golden milk sounds HEAVENLY! I didn’t think molasses was paleo? Just made these. They are delicious. I used 3 drops of Ginger essential oil in the batter instead of ground ginger. Thanks for sharing the recipe. So thrilled to hear you’re enjoying them, love that you used essential oil! The batter came out too wet for me as well and spread out more. When I added a tad bit extra flour, I was able to form it into balls and did not spread as much and looks like the picture. Soft, chewy, flavorful! Glad you were able to correct by adding a little extra coconut flour! Thanks for the feedback, enjoy! These look amazing! And I think I have exactly a 1/2 C of coconut flour left ;) I don’t have any coconut sugar and prefer not to buy things I don’t regularly use. I know I could sub a less healthy sugar, like brown sugar, but do you think another liquid sweetener would work…along with the molasses, of course–maple syrup or honey, maybe? Hi Erin, unfortunately these will be way too soft if you use a liquid sweetener, so I’d recommend sticking to a granulated sweetener. Enjoy! 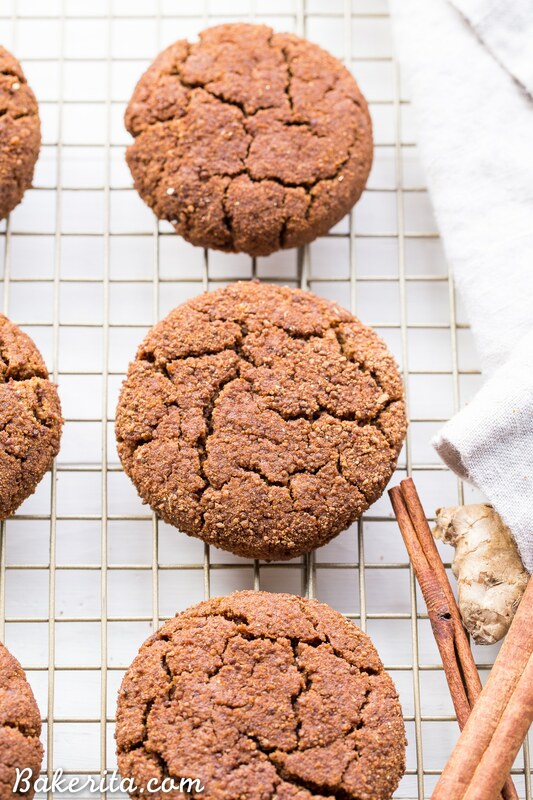 Could you use something else besides almond butter for the gingerbread cookie recipe? I have any allergy to nuts. And what’s a good brand for coconut flour? Thanks! Hi Michelle, you can use sunbutter to keep these nut-free. I like Bob’s Red Mill and Anthony’s for coconut flour. Enjoy! Hi! Wondering if you can use a cookie cutter with this recipe to make gingerbread men? Or would it be too wet/sticky? Hi Stephanie, it’s definitely too sticky for that, and they puff up so they wouldn’t keep their shape well. Hi! I want to make these so bad, but have one question: My husband is highly allergic to Tree Nuts (so every but BUT a peanut) which means almond butter is a no. Can I use normal peanut butter or what do you suggest? Hi Hope! Peanut butter would work but might affect the flavor, and Sunbutter would also work to keep them nut-free. Enjoy! Hi! If I want to use unsalted butter instead of coconut oil, would the ration be 1:1? Or should I use slightly more/less than 2 tablespoons of butter? Hi Erin, yes you sub butter 1:1 so you’ll use the same amount. Enjoy! Hi Olivia, so glad you like the cookies! Did you use kosher salt? If you used regular table salt instead, that can be why it’s too salty. Very odd about the smaller yield – did you make any ingredient changes to the recipe? Hi Jen, I think your assumption is the right one! I’ll add a note to use unsalted almond butter & skip the salt if it’s salted. Thanks for your feedback! These are amazing!!! I love how fluffy and chewy they are! Thank you for the incredible recipe!! So thrilled you’re loving them Kristen! Made these last night and oh my goodness they were the perfect taste and texture. I didn’t have any allspice so I used cloves, came out great! I followed everything else to a T and they came out moist and flavorful. Will definitely be making these again soon! uau! these cookies are awesome! I used honey as I didn’t have molasses and the texture and taste are amazing. Just tried making these. Did half the recipe and used 1 egg, and used 1 Tbsp of cane sugar instead of 1/2 Cup of coconut sugar. They came out great, although I left them in for 20 min at 325 degrees and the whole cookie is basically crunchy. Will try 15 minutes next time. Great recipe! Hi Emily – 20 minutes is double the called for baking time, so that’s why they turned out crunchy. You should only bake for 10-11 minutes, as the recipe calls for. I wanna make these soon for Xmas because I have to bake it all in advance. Can I store them for 10 days? Will they harden or ….? I definitely would not recommend baking them now and just letting them sit for 10 days – they won’t be nearly as good. My favorite way to prep cookies in advance to prep everything right until baking, including forming the cookie dough balls, and then freezing those on a baking sheet. Once they’re hard, throw them in a zip bag or airtight container, and then bake the day or the day before you need them. Hope this helps!